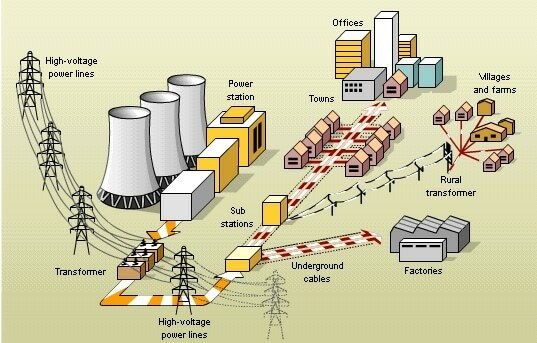 Stay in constant synchronization of multiple elements in a Power System has become an extremely important task in the operation of Power Systems; this result is due to the expansion of the electric power systems that increased the interconnection of generating stations and the various load centers. The electromechanical dynamic behavior of the main systems-generators-excitation motors, various types of motors and the different types of loads with very variable dynamic characteristics, it can be studied through some simplified procedures to understand more clearly the processes involved. (a) Stability in stable state or permanent regime. (b) Stability in transitory regime. The term stability when it used in connection with power systems, it is so called to the attributes of the system or part of the system, which allows it to develop restoration forces among its elements, equal or greater than the disturbing force to restore a state of synchronism and balance between the elements. 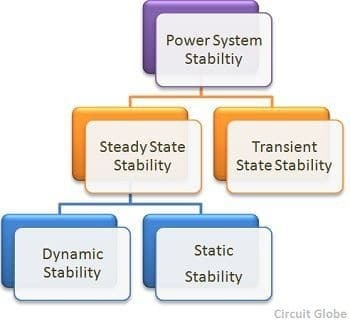 It is verified that a power system is in stability of stable state or permanent regime, for a specific operative condition of stable state,if it returns to the same steady-state operating condition after a disturbance. Such disturbances are generally small in nature. Larger disturbances can change the operating state significantly, but however, it will be still in an acceptable stable state. This state is called a transient state. A stability limit is the maximum possible load flow through any particular point in the system, without causing stability losses. The permanent regime stability limit refers to the maximum possible flow of energy that can pass through a given point without loss of stability when the energy is increased gradually. Transitory regimestability limit refers to the maximum possible flow through a determined point, without loss of stability when a sudden disturbance occurs. Every system is subject to disturbances in transitory regime, being the limit of stability in transitory regime, usually, lower than the limit of stability in the permanent regime. The most frequent disturbance so that the limit of transient stability is known,it is due to a fault or a disconnection circuit from the several parallel lines or a combination of a failure and subsequent isolation by disconnecting the system.In some cases the stability of the permanent state will be the limiting factor in overloaded systems after the end of the transitory period. The third aspect of stability to study is Dynamic stability, is generally associated with the response of the excitation system and the complementary control signals that involve the excitation system. Instability refers to the conditions that involve the loss of “synchronism”, which is also the same as “falling out of step” with respect to the rest of the system. Steady state or steady state stability studies often involve a single machine or the equivalent of a few machines connected to an infinite bus.Submitting them only to small disturbances, this study includes the behavior of the machine in small incremental changes in the operating conditions on a point of operation in a small variation in the parameters. When the disturbances are relatively larger or failures occur in the power system, this system enters into transient state.The transient stability of the system implies non-linear models. Transient internal voltage E; and transient reactances X ~ are used in the calculations. The first oscillation of the machine (or machines) that occurs in a shorter time usually does not include the effect of excitation system nor the load frequency control system.The first transient stability oscillation is a simple study that involves a time that does not exceed a second. If the machine remains stable in the first second, it is presumed to be stable transient for those disturbances.However, when the disturbances are larger and require a study for a longer period of more than one second, multiswong studies are carried out that affect the turbine-generator and excitation controls. The inclusion of any complementary control or control system will be dependent on the nature of the disturbances and the objective of the study. Share your knowledge too in the comments section down below! or copy this trackback: http://engineering.electrical-equipment.org/electrical-distribution/stability-in-power-system.html/trackback from your own site.